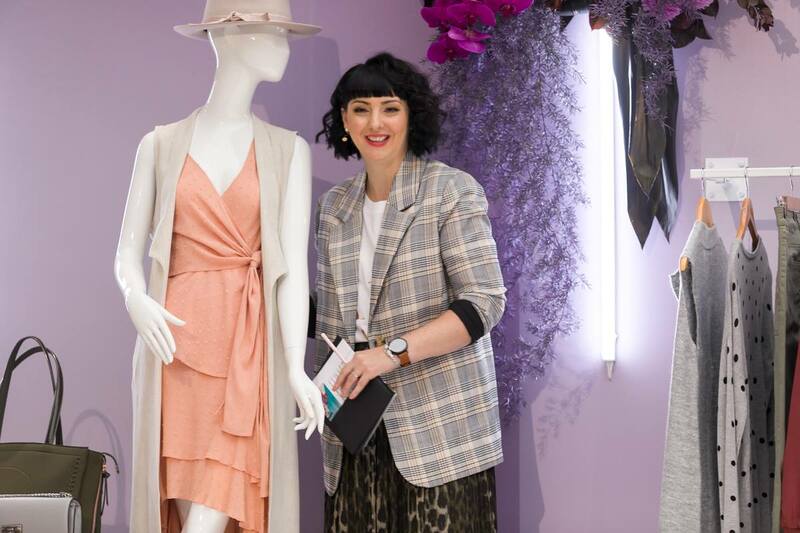 For those who attended the autumn/winter fashion workshops at Toowong Village on Saturday, we hope you left inspired by the best picks of the season from myself and Nikki Parkinson. If you couldn’t join us on the day, here is a recap and if you’d like to see a full image gallery, including social photos taken on the day, visit the Toowong Village Facebook page. So this new season for me is about a few things. Firstly, animal print can not be avoided (and nor should it be for that matter). There are other things, but this is key. Let’s explore. Animal print (and I say animal because snake is just as important as the ubiquitous leopard this season) is more varied and beautiful than I think I’ve seen, well, as long as I can remember. Recently I’ve purchased the Witchery skirt I wore for the workshop, which also comes in a wrap dress FYI and this Saba tee in PINK and navy leopard, that you’ll find in David Jones. On my gorgeous model Brooke on Saturday, we saw the leopard tee from Kmart, a bargain at $12, and, as you’ll see below, tights from Lorna Jane which pick up on the trend in an abstract way, but are absolutely leopard all the way. Key to these looks as well you might notice is the khaki Eb & Ive sleeveless jacket from Botanical Grace – a game changer to add one of the other key trend colours for this winter (khaki) but also add a layering element to create interest for your look, without the bulk. Because I can’t get enough of khaki, I chose to feature the khaki blazer from The Fifth Label (bottom) with very cool black coated jogging pants and an Aje tee from David Jones, finished off with an Ace of Something hat, Mimco cross-body bag and Wittner boots. It was my favourite look of the day on Brooke – very cool. Ok let’s talk about denim. The first look I chose to feature for Brooke was a denim dress from Seed (with Country Road knit and bag, Seed leopard (there it is again) scarf and Wittner boots. Denim is a big deal this winter. Jeans come in a broader variety than ever, denim jackets (hi 90s) are back in a big way and the great news is of course you can style denim differently each way you wear it, so find what works for you and roll with it all season. Another stand-out trend for this winter and yet another nod to the 90s is checks and plaid. Checked blazers are big news (mine pictured at the top is by The Fifth Label at David Jones) and Country Road has released this skirt Brooke wore (below) as well as a flared pant in the same print. It’s a great neutral base to work back with coordinating plain colours for a very wintery tonal look, and I’m a big fan. While trends inspire creative change for our new wardrobes, there’s nothing quite like a classic. This Studio W trench (above) is very much that, a timeless addition that’s quite perfect for Qld winter. What I love about a trench also is its ability to create a beautiful hourglass silhouette by giving definition to the shoulders and structure to the waist. Last but not least, we can start to think occasions – winter racing season, the parties that crop up between now and spring, and all of the other occasions that call for something a bit special. Cue is always a go-to for occasion dressing, and this season you’ll find beautiful prints such as this black-based floral below, and some statement silhouettes such as the dramatic look below that (paired with Camilla clutch and Gregory Ladner headband, both from David Jones). 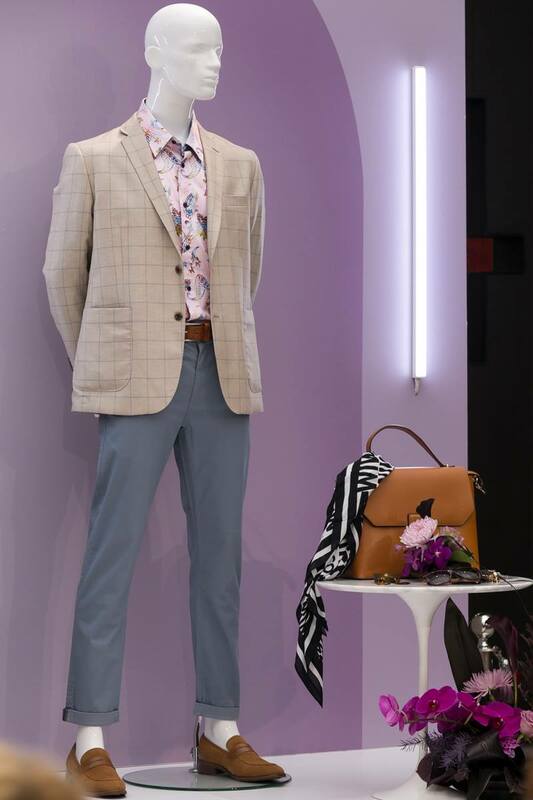 Last but not least, I couldn’t talk occasions without some stylish options for the guys so this look from Studio for Men started with the gorgeous John Lennon shirt and built from there for a light-weight but winter-appropriate smart-casual look. To celebrate the autumn/winter season launch, we have two $500 gift vouchers to give away through the Toowong Village Instagram and Facebook page. Keep an eye out for the competition later this week.